This was passed along to me in an e-mail and I learned something I never knew. Just wanted to pass it along to everyone. BARON DE BASTROP COMES THROUGH! This is a tale of how a man with a rough start can accomplish great things. Felipe Enrique Neri, colonizer, legislator, and self-styled Baron de Bastrop, was born Philip Hendrik Nering Bögel in Paramaribo, Dutch Guiana, on November 23, 1759, the son of Conraed Laurens Nering and Maria Jacoba (Kraayvanger) Bögel. He moved to Holland with his parents in 1764, and in 1779 enlisted in the cavalry of Holland and Upper Issel. Bögel married Georgine Wolffeline Françoise Lijcklama à Nyeholt in Oldeboorn, Holland, on April 28, 1782 and they had five children. The family settled in Leeuwarden, where Bögel served as collector general of taxes for the province of Friesland. His military service, marriage, and appointment as tax collector suggest that he was a staunch supporter of the aristocracy during the late-eighteenth-century revolutionary period. He always gave the French invasion of Holland as his reason for leaving the country, but he actually left for different reasons. In 1793 he was accused of embezzlement of tax funds and fled the country before he could be brought to trial. After the Court of Justice of Leeuwarden offered a reward of 1,000 gold ducats to anyone who brought him back, Bögel adopted the title Baron de Bastrop. 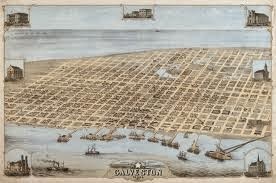 By April 1795 he had arrived in Spanish Louisiana, where he represented himself as a Dutch nobleman. During the next decade he received permission from the Spanish government to establish a colony in the Ouachita valley and engaged in several business ventures in Louisiana and Kentucky. 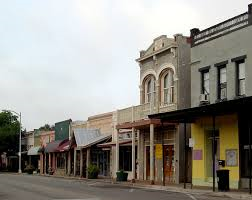 After Louisiana was sold to the United States in 1803, Bastrop moved to Spanish Texas and was permitted to establish a colony between Bexar and the Trinity River. In 1806 he settled in San Antonio, where he had a freighting business and gained influence with the inhabitants and officials. In 1810 he was appointed second alcalde in the ayuntamiento at Bexar. 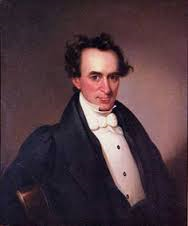 One of his most significant contributions to Texas was his intercession with Governor Antonio María Martínez on behalf of Moses Austin in 1820. Because of Bastrop, Martínez reconsidered and approved Austin's project to establish an Anglo-American colony in Texas. After Austin's death, Bastrop served as intermediary with the Mexican government for Stephen F. Austin, who would have encountered many more obstacles but for Bastrop's assistance and advice. 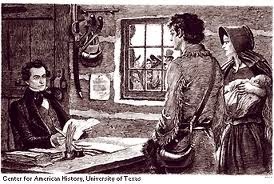 Stephen F. Austin,"The Father of Texas,"
In July 1823 Luciano García appointed Bastrop commissioner of colonization for the Austin colony with authority to issue land titles. On September 24, 1823, the settlers elected Bastrop to the provincial deputation at Bexar, which in turn chose him as representative to the legislature of the new state of Coahuila and Texas in May 1824. During his tenure as representative of Texas at the capital, Saltillo, Bastrop sought legislation favorable to the cause of immigration and to the interests of settlers; he secured passage of the colonization act of 1825; and he was instrumental in the passage of an act establishing a port at Galveston. His salary, according to the Mexican system, was paid by contributions from his constituents. The contributions were not generous. Bastrop did not leave enough money to pay his burial expenses when he died, on February 23, 1827. His fellow legislators donated the funds to reimburse Juan Antonio Padilla for the expenses of the funeral. Bastrop was buried in Saltillo. Even in his last will and testament, Bastrop continued to claim noble background, giving his parents' names as Conrado Lorenzo Neri, Baron de Bastrop, and Susana Maria Bray Banguin. Some of his contemporaries believed him to be an American adventurer; historians have thought him to be a French nobleman or a Prussian soldier of fortune. Only within the last half-century have records from the Netherlands been found to shed light on Bastrop's mysterious origins. Although his pretensions to nobility were not universally accepted at face value even in his own lifetime, he earned respect as a diplomat and legislator. Bastrop, Texas, and Bastrop, Louisiana, as well as Bastrop County, Texas, were named in his honor. 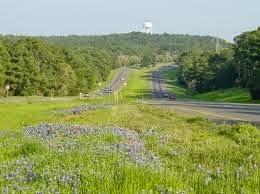 Bastrop County consists of coastal plains just below the Balcones Escarpment and encompasses 895 square miles of southeast central Texas. Its seat of government, Bastrop, is situated in the center of the county about thirty miles southeast of downtown Austin. The terrain throughout most of the county is characterized by rolling uplands and broken hills with surface layers of primarily sandy, loamy soils, and woods where post oaks predominate but where cedar, hickory, elm, and walnut also occur. In the northwestern corner of the county and along the central southeastern border, the topography changes to blackland prairie with waxy clay soil and tall grass cover. The Colorado River bisects the county from northwest to southeast; along this waterway and its tributaries can be found rich alluvial silts and clays. Near the river, the Lost Pine Forest extends through an east central section of the county. Elevations range from 400 to 600 feet above sea level. The county's climate has been described as subtropical humid, with a low average January temperature of 40° F, a high average July temperature of 96° F, and an average annual rainfall of 36.82 inches; the growing season is 270 days long. Mineral resources include clay, oil, gas, lignite, sand, gravel, and surface and underground water. The McCormick site near McDade has produced archeological evidence of human life in the area during the Neo-American period, a thousand years ago. 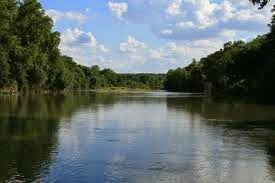 By the beginning of the nineteenth century, Tonkawa Indians inhabited the area, and Comanche Indians came to hunt along the river each autumn. With an early road between Nacogdoches and San Antonio running through the region, in 1804 Spanish governor Manuel Antonio Cordero y Bustamante established a fort at the Colorado River crossing where the town of Bastrop now stands. In 1838 another significant industry began when the Bastrop Steam Mill Company started operation. It initiated Lost Pines lumbering activity that reached a peak in the early 1840s, as Bastrop mills supplied lumber to Austin, San Antonio, Houston, and other settlements. Lumber production continued for decades until available timber declined, but agriculture remained the predominant means of making a living. Between 1850 and 1860 the population of Bastrop County more than tripled, reaching 7,006, with 2,248 slaves making up almost a third of the total and foreign-born residents totaling 700. The county had 596 farms in 1860, and livestock raising was growing; the number of cattle increased from about 12,000 in 1850 to over 40,000 in 1860. Six churches were reported in an 1860 survey: two Methodist, two Lutheran, one Christian, and one Baptist. 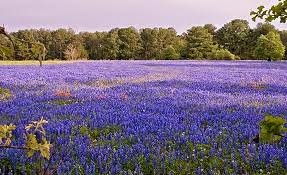 In 1870 Bastrop County's population topped 11,000, and it had thirty-four manufacturing establishments. The following year brought a further stimulus to growth in the form of the Houston and Texas Central Railway, completed through the northern part of the county to connect Austin and Brenham. Towns soon sprang up along the railroad, the most substantial being Elgin. Now many farmers had a freight outlet for their harvests of corn and cotton. 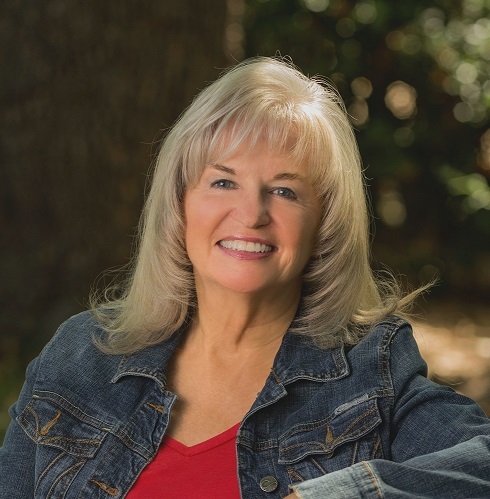 Bastrop is only ten miles from the fictional town of Valdesta, setting for the first book in a new duet boxed set titled MAIL-ORDER TANGLE. 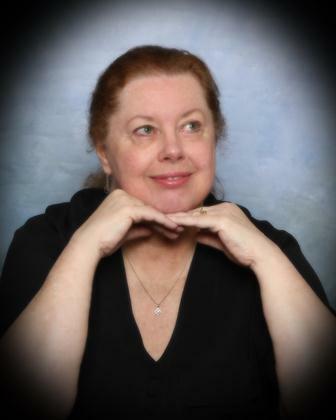 Jacquie Rogers' book is MAIL-ORDER RUCKUS and mine is MAIL-ORDER PROMISE. This boxed duet goes on sale September12th, but is available for preorder on Amazon. Ellie Dickerson and her sister are in desperate straits when she contracts to become a mail-order bride to a Texas rancher on the condition her sister can accompany her. After her arduous trip from Virginia, she learns her fiancé has died. His brother has sworn to take care of her. He's handsome. He's single. And he doesn't want her. What will happen to her and her sister? Kage Johanssen, co-owner of a ranch in Idaho with his cousin Matt, is forced to take over his family’s Central Texas ranch on the death of his older brother. Kage is in no hurry to get married, and when his brother’s bride shows up, she’s everything he doesn’t want in a wife—except she’s a stunningly beautiful redhead. Despite his deathbed promise to his brother and his attraction to Ellie, he’s convinced she doesn’t have the grit to be a rancher’s wife. MAIL-ORDER TANGLE will be released September 12th, but is available for preorder now on Amazon. Two books for only $3.99. What a deal, right? This post isn’t all about cowboys or the west. I hope no one minds. My son received a genealogy software program for Christmas last year and we all enjoyed the tidbits of information he found while researching our family heritage. Some of it was new, other bits we’d heard about from other relatives over the years. 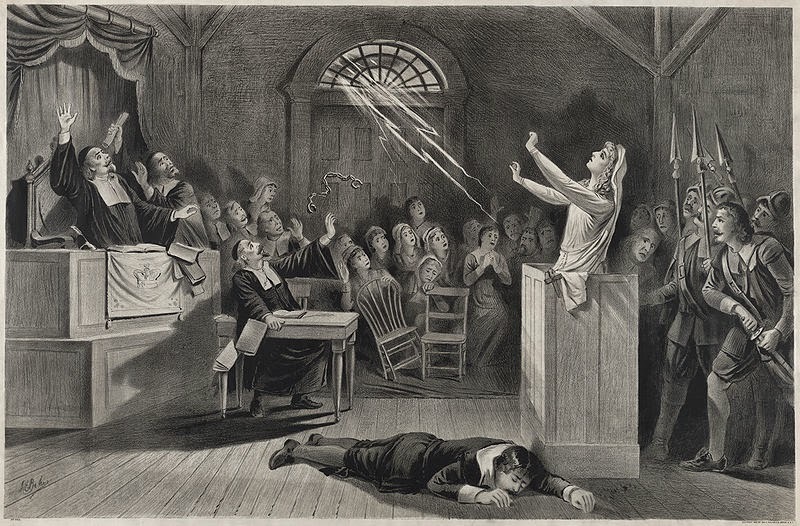 The most significant probably being my 8 times great-grandmother was imprisoned in 1692 for witchcraft in Salem. Her name was Elizabeth Austin Dicer and she was married to William Dicer. Her trial records have not survived according to the sites I’ve found, and she lived in Gloucester, not Salem. However, the women accused in Gloucester were divided between the Salem jail and the Ipswich jail. She was part of a group of women whose families petitioned for them to be released from jail in November 1692 because the conditions were so horrible. They promised to return in June. It appears none of the women were made to return because around that time is when the wife of Gov. Phipps was accused and the entire fiasco was called to a halt. 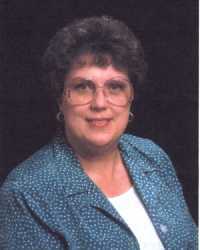 Her son-in-law is who petitioned Elizabeth’s release. His name was Richard Tarr and was married to Elizabeth’s daughter also named Elizabeth. 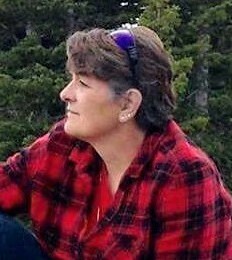 My paternal grandmother’s maiden name was Tarr and her line of grandfathers leads directly to Richard. From what I’ve discovered Elizabeth Dicer may have been a bit of a crotchety person who accused others of witchcraft prior to her arrest. As we now know, the entire fiasco was a tragedy that could have been avoided with a bit of education, but times were different back then—not so long before then they’d believed the world was flat. I told her about Elizabeth Dicer and a plot for a romance story ‘lightly based’ on her plight that had been tumbling around inside my head. She said to write up a synopsis and send it in. I did that last week, so now I wait to see what the rest of the historical team thinks. Writing in a somewhat uncommon era has its benefits and downfalls. It can be looked upon as something new and unique, but readers may not want to embrace reading stories in a time period different from what they’ve come to know and love. I’m guilty of that myself at times. I have no idea if Harlequin will give me the go ahead on my story or not, until then I will focus on a couple other works in progress where the heroes are cowboys. 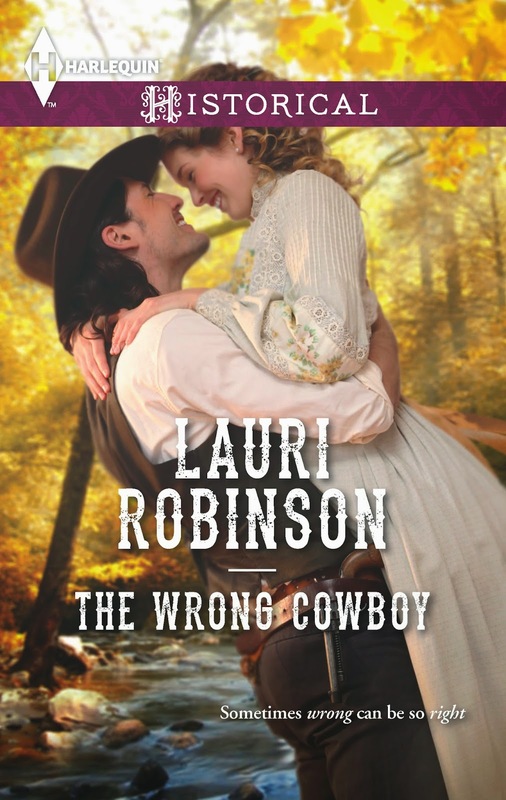 Such as my next release (November 1st) which is appropriately titled, The Wrong Cowboy. Fall is quickly approaching, the kids are going back to school, and we all know what that means – flu season. But people aren’t the only ones who suffer from influenza. Our dogs, cats, and horses can get the flu, as well. Equine Influenza outbreaks these days can have economic impacts on the racing and showing industry. But what about in the nineteenth century? Everything was dependent on horse power back then, just as we depend on gasoline today. An outbreak could have devastating consequences. 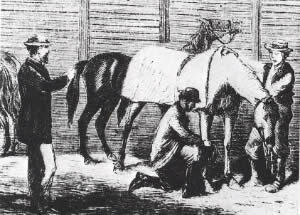 In 1872, an outbreak of equine influenza crippled the US economy. It came to be known as the Great Epizootic of 1872. The Long Riders’ Guild Academy, the historical organization that researched the outbreak, has said that "The Great Epizootic was the worst equestrian catastrophe in the history of the United States - and perhaps the world." When horses became unable to perform their duties in the eastern cities, the economy came to a grinding halt. In fact, the influenza outbreak that year is said to have been a major contributor to the economic crash in 1873. The first cases of the disease were reported in Toronto Canada, and within three days spread to New York. It took less than three days for the street car horses to become infected and unable to perform their jobs. Three weeks later, the New York Times reported that all of the cities public stables had been infected, and more than 95% of the horse population had been rendered useless by its owners. "It is not uncommon along the streets of the city to see horses dragging along with drooping heads and at intervals coughing violently." On October 30, 1872, a complete suspension of travel had been noted in New York. 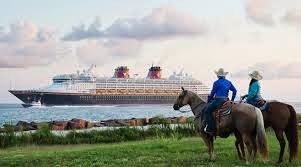 Massive backups at ports and with freighting companies occurred, because horses could no longer pull the loads from the docks. They couldn’t pull the coal cars that supplied fuel to the railroads. 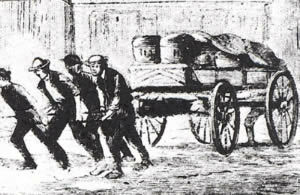 Men were forced to pull wagons by hand. Trains and ships full of cargo stood unloaded. Perishable food spoiled. "Coal cannot be hauled from the mines to run locomotives, farmers cannot market their produce, boats cannot reach their destination on the canals ..."
One of the greatest casualties that was directly associated to the equine flu outbreak occurred in the city of Boston. Fire engines back then were drawn by horses, and with the animals sick, could no longer respond to fires. 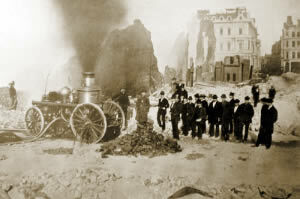 A fire broke out in the city on November 9th, and the firemen were required to pull their own equipment, severely impeding their firefighting abilities. The fire raged and became one of the worst disasters in the city’s history. It killed 13 people, destroyed 776 buildings, and cost over $75 million. Out west, even the US cavalry was affected. The flu virus had spread south to Mexico and Cuba, and also to the Pacific coast. The soldiers fought their Indian campaign against the Apache on foot. The Apaches had to do the same, as their animals became infected as well. 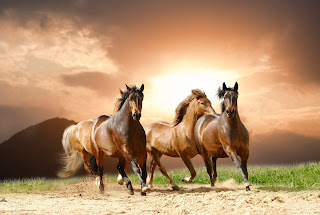 The vast majority of affected horses that survived (the mortality rate was said to be 10%) were fully healthy again the next year, but the economic impact of the outbreak was felt by major cities for years to come. 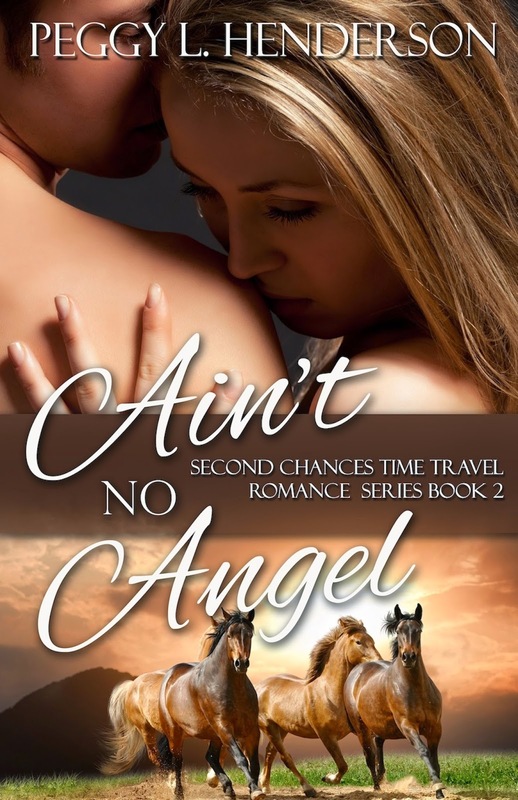 In my time travel romance, Ain't No Angel, this epidemic plays an important role in the story, as the influenza outbreak reached my hero's Montana Ranch. “This colt has the flu, like I said. Any idiot can see that.” She glared toward Gabe. Tyler no longer held back his smile. His little wife was displaying her feisty side, and she wasn’t backing down. His insides warmed. She defended the horses as a mother would defend a child. “Flu? What the hell is that? I ain’t never heard of it,” Gabe sniggered. “You’ve seen this before?” Tyler stepped closer to her. Laney met his stare. She looked ready to do battle with him. “What is flu?” Tyler asked, wanting to understand her. “How do you treat it?” Tyler asked quickly. The dead colt at Ian’s place popped into his mind again. If his and Ian’s horses suffered from an influenza outbreak, it could have devastating consequences, assuming it was as deadly as it was in people. He’d never heard of the illness in horses, and he was only vaguely familiar with the symptoms of the grippe in people. A neighboring community had suffered an outbreak several years ago, and many of the townsfolk had died. “There was a colt at Ian’s place last week that had the same symptoms before it died,” he said slowly. “He’s lost several foals since then.” Tyler frowned. Where had this sick animal come from? Anger surged in him. There would be hell to pay when he found the owner of that dead colt. “Then I suggest you tell Ian that he’d better keep an eye out for his horses. 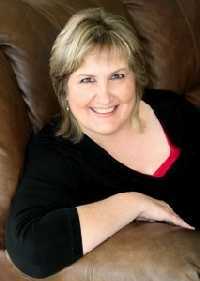 If any of them drink the same water, or eat from the same feed barrel, they’ll be exposed,” Laney said firmly. Tyler recalled watering the horse he rode to Ian’s place at the trough in Ian’s yard. Was that how he had brought the illness back to his ranch? He cursed under his breath. The saddle horse wasn’t infected, as near as he could tell. He appeared well when he rode him the day before. He’d ridden Charlie to Ian’s ranch this morning. Damn. “If you’ve seen this before, how is it treated?” Tyler’s admiration for his wife grew. Where had she learned so much about horses? The women he knew, even the rancher’s wives, simply didn’t pay that much attention to what was always deemed as men’s business. Laney glanced from him to the wranglers standing outside the stall. “Well, you have to keep the sick horses away from the healthy ones. Don’t share feed or water buckets, bridles, anything. Everything you touch needs to be disinfected. There’s really no treatment. It has to run its course.” She stopped to gape at him. “Where I’m from, it would have been easier to prevent with . . .” She shook her head and her eyes widened as if she’d said too much. Prevent with what? Tyler didn’t have a chance to ask. “I still say draw the diseased serum out of him. Blistering is a sure-fire way to rid horses of their ailments,” Gabe said. Tyler didn’t know what to think. His foreman was a knowledgeable horseman, and he himself would have opted for the treatment Gabe suggested. 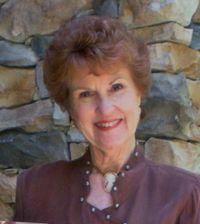 Laney’s firm conviction in what she said gave him pause even if some of her unfamiliar words were downright perplexing. How she knew all of these things was a question he’d ask later. “I’ll do whatever you think will get these horses well again, Ty,” Gabe said slowly. His eyes lingered on Laney, his expression unreadable, then he turned to Eddie and Sammy. “You heard the boss. Let’s go check out the other horses before it gets too dark. Any sick ones, we’ll separate into the south pen.” He nodded toward Tyler, then strode from the barn, the other two wranglers on his heels. Tyler turned toward Laney. She twisted the rope in her hand into a tight knot. She offered a soft smile, but the worry remained in her eyes. He stepped closer. “You said this could have been prevented. How?” He reached for her hand. Her eyes widened in panic. “I . . . I didn’t mean totally prevented. I meant the spread could have been prevented.” Her eyes darted to the colt in an obvious attempt to break eye contact. There was something she wasn’t saying. What did she know that she didn’t want to divulge? Tyler shrugged it off for now. It was too late for prevention, anyhow. “I’ve had the strangest feeling that there’s more to you than what you’re letting on. One of these days I’m going to figure it out, but until I do, I want you to know I’m glad that you’re here, Laney,” he said quietly, sincerely. If only her passion for the animals would extend toward him as well.